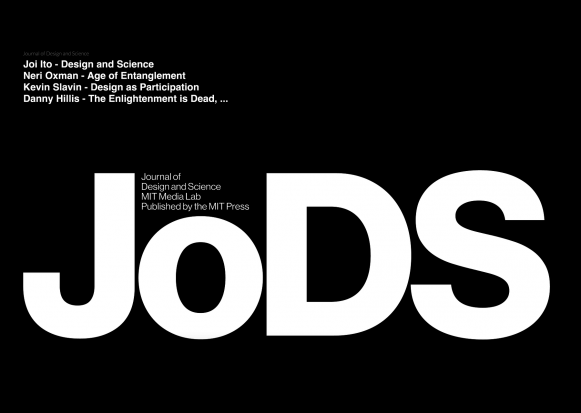 From the MIT News website: The MIT Media Lab and the MIT Press have jointly launched the Journal of Design and Science (JoDS), an online, open-access journal whose aim is to capture the antidisciplinary ethos of the MIT Media Lab while opening new connections between science and design. “We are joining forces with the MIT Press to create a new model for academic publishing,” says Media Lab Director Joi Ito, who will lead the journal’s curatorial team. Unlike journals that operate within a formal peer-review system, JoDS invites lively discussions across all fields of design and science, unconventional formats, and widespread participation, encouraging authors to engage in ongoing discussion with members of many different communities. The goal is to provide for a much broader array of perspectives, new pathways forward, and emergent topics for further research. The first volume includes articles by Joi Ito, Media Lab professors Neri Oxman and Kevin Slavin, and inventor and scientist Danny Hillis. It is dedicated to Marvin Minsky, who passed away last month. “It is only appropriate that this publication be dedicated to Marvin,” says Ito. “He was a brilliant thinker and founding member of the Media Lab, who pushed disciplinary boundaries and constantly challenged the status quo.” JoDS’s format is made possible by the new PubPub publishing platform, created by researchers Travis Rich and Thariq Shihipar in the Media Lab’s Viral Communications group, working with Andrew Lippman, who heads the group. PubPub provides rich commenting features and powerful, intuitive authoring tools. JoDS articles are authored directly within PubPub, which also enables easy integration of multimedia, images, and large data sets. “This collaboration is a natural extension of the alignment between the Media Lab and the press,” says MIT Press Director Amy Brand. “It represents a new vision for the future of scholarly communication, as well as the importance of the conversation between scientists and designers." In addition to online journal publication, future applications for the PubPub platform could include a new model for thesis submission, or a rich platform for ebook publishing.